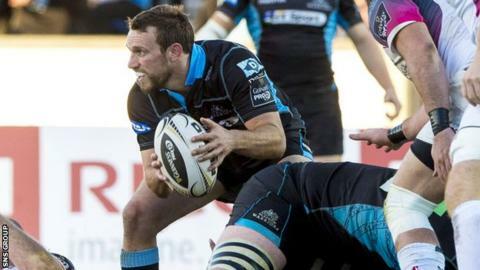 Glasgow Warriors scrum-half Mike Blair says sport can play a unifying role following the attacks in Paris. Warriors' tie against Racing 92 was postponed on Saturday in the wake of events in the French capital. England face France in a football friendly at Wembley on Tuesday and Blair believes it will be an emotional evening in London. "Sport is something that brings people together, brings countries together," said 34-year-old Blair. "From my experience of playing in France, when there is something to play for and emotion involved, that's when a team really gets behind each other. "I hope the English supporters and French supporters really enjoy the game and get behind both teams." Blair revealed the squad was "100% behind the decision" to postpone the game after a "distressing" evening in Paris. The Warriors now need to refocus for Saturday's Champions Cup fixture against Northampton Saints at Scotstoun. "Being there, we were very aware of what was happening and we need to be respectful to the people of Paris," explained Blair, who played in France with Brive. "But, from a sporting point of view, we need to try to move on as quickly as possible. "People deal with these situations in different ways but one of the personality traits of top sportsmen is being able to 'park' things like that to concentrate on the matter in hand. "It's like making a mistake on the pitch, you park that mistake and focus on what your job is. "I'm aware that it sounds bad comparing something like that with what happened in Paris but I'm just trying to share an example of how you park an incident. "You ask someone else and they might have it on their mind. The guys that I have spoken to are probably comfortable in dealing with their emotions. "We now start with a home game against Northampton in front of a sold-out ground and everyone is looking forward to getting stuck in."